Im späten 17. Jahrhundert feierten englische Musiker jedes Jahr am 22. November die heilige Cäcilie als Schutzheilige der Musik mit besonderen Konzerten und Gottesdiensten. 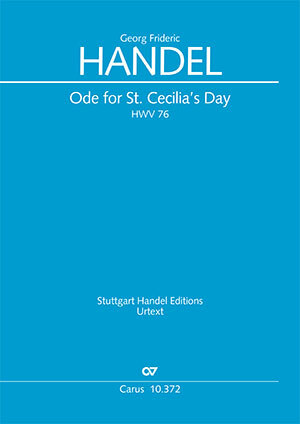 Mit seiner Ode for St. Cecilia’s Day (HWV 76) ließ Händel die Tradition dieser Festivals am Cäcilientag 1732 wieder aufleben. Die sogenannte „kleine“ Cäcilienode ist ein musizierfreudiger Lobpreis auf die Macht der Musik: Zwei feierliche Chöre umrahmen fünf reizvolle Arien, in denen jeweils ein Instrument solistisch vorgestellt und nach barocker Art unterschiedlichen Affekten zugeordnet wird. 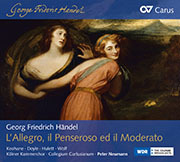 Dabei lässt Händel den Solisten, insbesondere auf seinem Lieblingsinstrument, der Orgel, viel Freiheit zur Improvisation und zur Demonstration ihres Könnens. Im Rahmen seiner Stuttgarter Händel-Ausgaben legt der Carus‑Verlag nun die Cäcilienode des Jahres 1739 auf einen Text von John Dryden (engl.) vor. 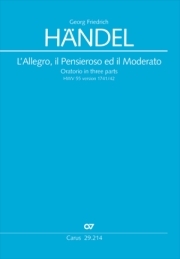 Neben den für Händel bezeichnenden festlichen Chören besticht das dreizehnteilige Werk durch ungewöhnlich phantasievolle Instrumentierung der Soloarien. Das Werk ist sicherlich einmal eine Alternative zum ewigen Dauerbrenner Messias, nur leider wohl nicht abendfüllend. The other problem is what to do with the minuets that end the Ouverture. The autograph has one in D minor followed by another in D major, with the D-minor one crossed out. The Ouverture is missing from the conducting score. 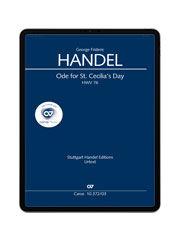 I haven‘t had a chance to check the early sources, but it is curious that the three pre-Chrysander editions I have (Arnold c.1792, The Handel Society, 1844-5, and Vincent Novello‘s vocal score from the 1850s) all have the related Minuet in D major that Handel used to end op. 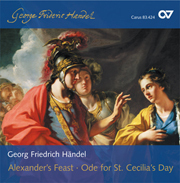 6/5 (whose first two movements are taken from the Overture to the St Cecilia‘s Day Song). I would guess this to have been normal 18th-century manner of performance. 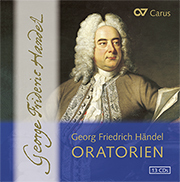 The Carus edition ignores Handel‘s deletion, reverses the MS order, and prints them as Minuet and Trio, not Handel‘s normal treatment when minuets end overtures. I‘d be happier if the suggestion were footnoted, not buried in the commentary. The editor misses that in the D major Minuet, the middle line is allocated to violin 3 as well as viola: at least, that‘s how it reads to me, both on the facsimile in the edition and on my microfilm. Were this a thorough critical edition, I would expect a slightly more precise commentary. I can‘t see on my film, for instance, the words Liuto and Org. at bar 39 of No. 7, although as suggestions they are sensible enough. But I have no hesitation in recommending this to customers. It is good value (about £22), clearly readable, with no cluttering German translation underlaid; instead, the poem is printed the introduction with a German version alongside.